Salmonella Typhimurium is an intracellular pathogen. It has many weird and wonderful capabilities that allow it to survive in host macrophages. 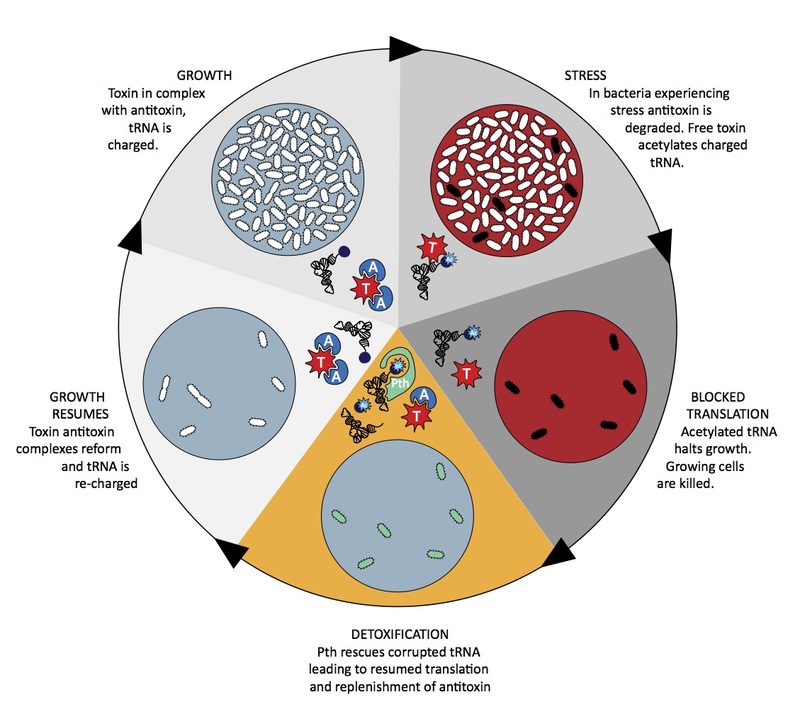 Once the bacterium is inside a macrophage, different modes of survival are possible. Our lab is interested in the cohort of bacteria that stop dividing after entry into a macrophage and maintain themselves quietly and discreetly, perhaps waking up later to re-establish disease. They are called persisters and there are many questions to be answered about these bacteria. What triggers them to stop growing? How do they stop growing? Can they wake up again, and if so how? One of the avenues of investigation we have taken is to examine toxin-antitoxin modules. 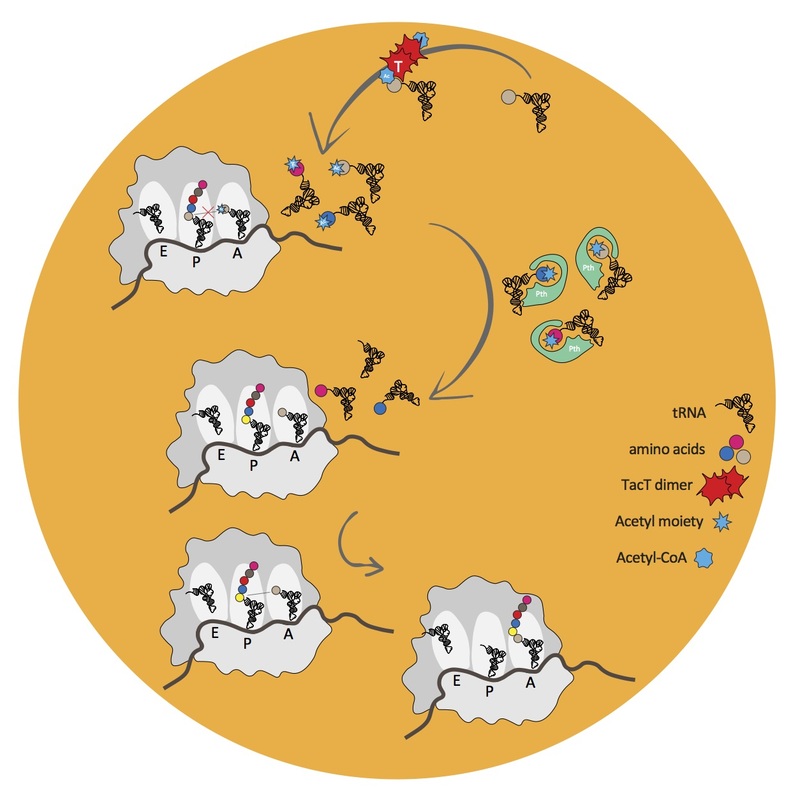 These modules encode a stable toxin that inhibits a vital cellular process and a labile, neutralising antitoxin, which is degraded under conditions of stress but otherwise binds and inactivates the toxin. Salmonella has 14 of these modules and they have been linked to the formation of non-growing bacteria. How do the toxins halt growth? To understand this we set about looking for the target of one toxin that was predicted to be an acetyltransferase. Acetyltransferases control many cellular processes by attaching an acetyl group to various molecules, usually the lysine residues of proteins. We searched extensively for such a protein finally discovering that the target is not a protein at all but in fact tRNA. We called the toxin TacT for tRNA acetylating toxin and found that it acetylates the primary amine group of aminoacylated-tRNA, preventing chain elongation during translation, leading to growth arrest. To resume growth the bacteria must detoxify the corrupted tRNA molecules. It can do this using a highly conserved, essential enzyme called Peptidyl-tRNA hydrolase (Pth). The main function of Pth is to recycle tRNA molecules when translation stalls through ribosome drop off. We showed that Pth can also hydrolyse tRNA molecules corrupted by TacT. Perhaps Pth is key in allowing persister bacteria to emerge from their non-growing state, waking up, to create a new infection. In our current study we investigated some clinical strains of Salmonella isolated in sub-Saharan Africa. All the clinical isolates we tested produced high levels of persisters following internalisation by human macrophages. The strains have two additional toxins that are structurally and functionally similar to TacT. The toxins differ in the tRNAs that they target. Since our initial study similar tRNA-acetylating toxins have been found in other species of bacteria. Interestingly, not all these toxins acetylate the same tRNAs as the TacTs. Perhaps this is a new family of toxins that are spread throughout the bacterial kingdom giving bacteria a fine-tuning mechanism to control their growth rate in response to changing environmental conditions. Perhaps it is not limited to the bacterial kingdom? Perhaps there are toxins out there that acetylate all the different tRNAs.